In my 30 years of collecting, I have never seen a piece like this. The collar is actually larger looking in person. It really stands out. The arms and back of this are a comfortable breathable knit, possibly a cotton knit. 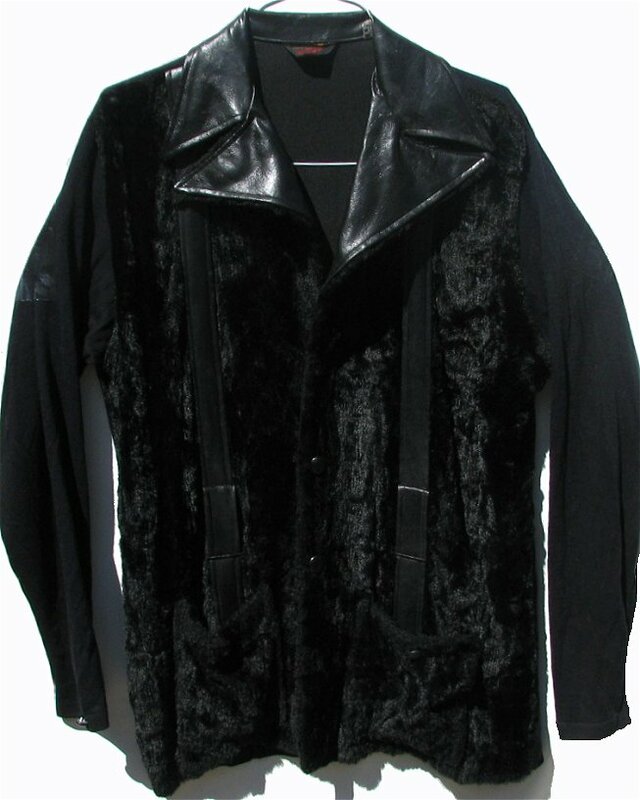 The front is covered in a shiny lightweight faux fur. It is dissected by two vertical vinyl strips down the front. And of course the giant fly collar jumps out. I don't know where the belt is to this. We may find it eventually. I don't think a belt is necessary, but I do have men's faux leopard covered belts and men's black or white 3 holed leather belts. The only imperfection I can see is a bit of fur missing from the bottom of one of the pockets. One would have to really pour over this to notice it. Although this piece is likely from the late 60s, it would fit a today's size Large. The chest at the armpit level is 45" around (and will easily stretch another inch), which means it would comfortably fit a 42"- 46" chest. The shoulder area is a true large size measuring 19 1/2" between the back shoulder seams. The sleeve length is approximately 34 1/4". The waist is 45" (meant to hang loosely if not belted). Hand wash and dry flat or air outside after wearing.